This image, centred on the B[e] star HD 87643, beautifully shows the extended nebula of gas and dust that reflects the light from the star. 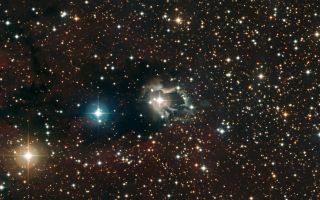 The central star's wind appears to have shaped the nebula, leaving bright, ragged tendrils of gas and dust. This cool space wallpaper, centred on the B[e] star HD 87643, beautifully shows the extended nebula of gas and dust that reflects the light from the star. The central star's wind appears to have shaped the nebula, leaving bright, ragged tendrils of gas and dust. A careful investigation of these features seems to indicate that there are regular ejections of matter from the star every 15 to 50 years. The image, taken with the Wide Field Imager on the MPG/ESO 2.2-metre telescope at La Silla, is based on data obtained through different filters: B, V and R.